On Friday, March 7, 2014, after a week of enjoying Dr. Seuss stories and being introduced to a variety of his character creations, Denair Elementary School students ended the week with an exciting Read Across America culminating event. Denair Elementary School has a Cross Age Buddy Program. This is where two classrooms at different grade levels pair up to provide learning experiences that promote Common Core Standards and literacy for both grade levels. On that day, the entire school gathered in the gym to read with their buddies. The students read several stories, and a good time was had by all! 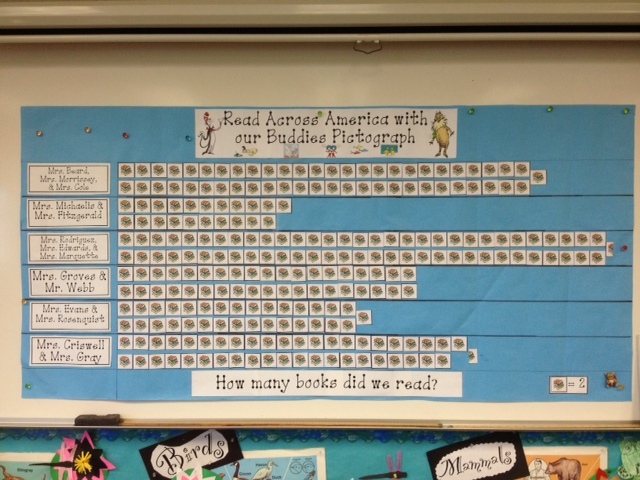 Students kept track of the number of books they read during the allotted time and made a pictograph of the results. Since each group knew only their own number, they used the pictograph and their math skills to determine the number of books read by the entire student body. Denair Elementary students read 498 books that day! Posted in News and tagged Denair Elementary School, Dr. Seuss, Read Across America.